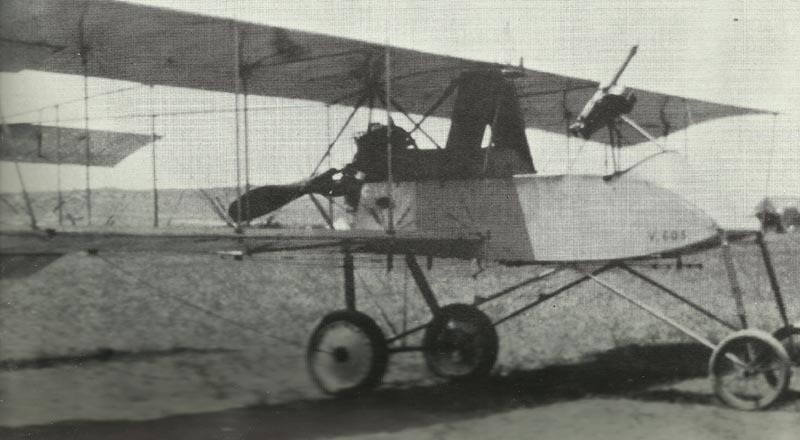 An RNAS Voisin on Imbros. Thy type was more than a match for any aircraft the Turks had at this time. Turkey: 3 RNAS aircraft (2 x 112lb bombs each) from Imbros and Enos first attack Kuleli Burgas rail bridge and damage its installation, near Bulgar border (river Maritsa, raids repeated on this Berlin­-Constantinople railway line strategic point on November 10,13,16,18 and 24). Salonika: Seaplane carrier HMS Ark Royal arrives. Western Front: 6 Royal Flying Corps 7 Squadron aircrafts bomb (with 2 x 100lb each) Gits airfield, agents report wounding 30-40 men and destroying 5 cars (others try to bomb Bellenglise airfield northwest of St Quentin on November 11). Champagne: East of Tahure and north of Massiges artillery duels continue. Britain: Admiral Jellicoe to First Sea Lord ‘I confess to being quite unable to recognize the necessity for sending further ships to the Mediterranean’. Britain: Underground coal miners’ enlistment stopped.